Lynn Crilly puts the many myths around OCD under the spotlight and shows how different the reality is. Based on her successful support of her own daughter and other sufferers she empowers readers with the knowledge to understand the condition, get the right help and find hope. Fabulous book for anyone involved with anybody suffering from OCD. Very highly recommended. Another fantastic book, incredibly insightful and helpful. Very highly recommend! An amazingly helpful book. Beautifully written and laid out. Really informative but also as someone that gets overwhelmed by books sometimes I found it an easy read. When I read this book, it literally changed my life, things I did, which I thought was normal, made me realise there was something more. I cannot thank Lynn and her amazing family enough for this book, it made me realise that I need to get the help that I needed. I would honestly encourage more people to read it. Another great addition to the hope collection. Covering all the obstacles sufferers and carers face with OCD and giving vital guidance thoughout. Couldn’t recommend more!! An excellent book for those struggling with OCD but also helpful for people around them. A must read for anyone working with young people as well! Cannot recommend this book more! Great book , great author !! Fantastic read and an inspirational author! Informative, practical and well-written for the everyday person. A great book. A real insight into the consequences of OCD. Offers practical help for sufferers and carers, Highly recommended. A brilliant book with great insight and knowledge. Lynn is a brilliant author and she makes sure she covers everyone who is affected by OCD. Amazing book with great guidance. Lynn is a fabulous author! This woman is an inspiration. I encourage everyone to read this and check out all her amazing work. Lynn is amazing at bringing sense and hope through her writing. Highly recommended – such a great book. Some times it takes some to think out side of the norm to come up with the right answer. Some times it take some one to think outside the nom to come up with the right answer. Fantastic book. I learnt so much from it. I always suspected I may suffer from it, and whilst it’s not as extreme as others, I recognised I was still valid of help. This book is perfect for anyone and everyone, I believed I was quite clued up on most mental illness’ but from every book Lynn has written I’ve learned so much. Lynn has done it again with another insightful, thought-provoking book, a great read! Lynn has turned our family’s life around. Her books take away the panic and restore you to clarity, strength and hope, and all her advice is from a real life, experienced, reassuring perspective. An inspiration to have the courage and determination to challenge the system and find light at the other end! Amazing self help book. Would highly recommend!! Lynn is fabulous! 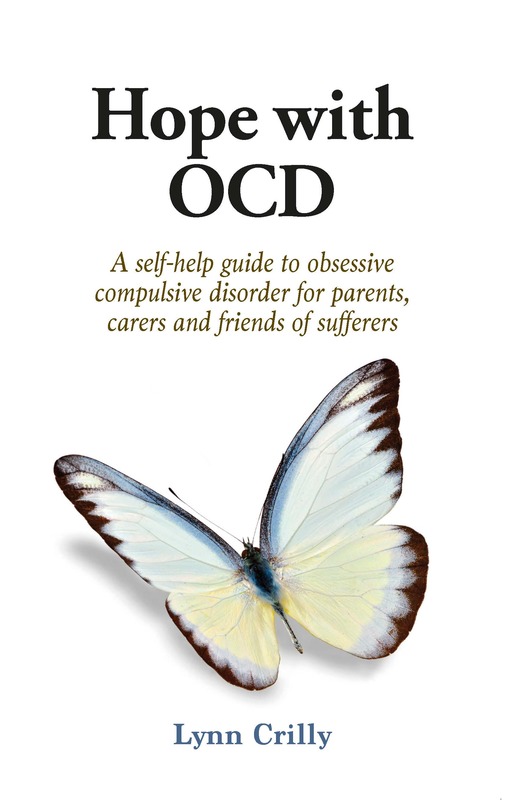 Excellent, informative, easy to read book that is helpful and insightful for people with OCD,carers and professionals. Spread the word as OCD is now so widely spread and few know how to cope. Your loving, nurturing writing style is what draws me back to your books. Having clear information is wonderful, as is the recognition that families and friends of OCD sufferers are affected by the sufferers condition, and have a vital role in the individuals recovery. Because it was easy to read it was so easy to understand. Such a great book & very of it’s time. Personal experience is so valuable – especially when it’s wrapped up in hope. A beautiful message with practical guidance. Best of luck, Lynn! Amazing book, great read it is very informative and interesting!!! Inspiring book and have given this book to my clients , who have all come back to me with positive feedback. This book is a rare combination – written from the heart and yet packed with facts, advice and invaluable information. It’s essential reading for any family touched by this illness. Lynn writes from experience and very much from the heart. Please read and find hope and inspiration. A great read, with facts and lots of help along the way. A must read for everyone! Especially families affected by this mental illness! Fantastic author! A user friendly guide to a difficult subject. Written with empathy and understanding. Great book. Helped me no end with my daughter. Brilliant, brilliant book. Great help just when I needed it. Absolutely brilliant book. Very informative and easy to read. Fantastic book and a fantastic collection. So informative and insightful, with great information from 1st hand experience. A shining light in the world of mental health! Brilliant book based on facts very imformative and easy to read. A must read for anyone suffering with OCD, is close to anyone suffering or just knows anyone who is affected by mental illness. Lynn is an inspiration and a very understanding person. Great author who has written this book from personal experience. Well written, this book takes our understanding of OCD to another level of awareness and clarity of this complex condition. A life changing book , helped beyond expectations! An amazing book, with an inspirational thought process to all those that need the guidance, we all can relate to many situations, either beit ourselves or a loved one. This book definately deserves to win the well deserved title! A fantastic book – like all of the publications Lynn brings out. Infused with hope, positivity and deep knowledge. Lynn stands out magnificently because of the huge, lived-through experience she brings to her writing and work. Wonderful book. Really helped me understand OCD. Truly insightful, down to earth and helpful. I know that I can rely on Lynn’s books to give heartfelt and helpful advice. Gave to a family member who found it easy to understand and the courage to get help. Really insightful book that is both educational but easy to read and understand. The words portray the compassion that Lynn has for the subject of mental health and as a reader I found it made me more comfortable with the concept and the people it affects. Really helpful to both sufferers and carers, putting words to what they’re going through and might find hard to express themselves. This book is so helpful, informative and compassionately put together. A really valuable resource for health professionals too. Highly recommend it. This book is truly inspirational and life changing for so many! Really insightful and can help you to gain a great understanding of how OCD impacts on the life of the suffere and those closest to them. Great book, another masterpiece from Lynn Crilly. Well done Lynn, another truly inspiring read! Well done Lynn! A very inspirational book! Another amazing book! very inspirational! Great help for carers and sufferers. Well done Lynn. Lynn is an amazing person with a wonderful insight! Grateful I got this book that help change my life for the better! Thank you. Lynn is an inspirational and caring therapist and author. Her books, including this one, help not only the person in need of help but also their families. I highly recommend her books. Lynn is a passionate and dedicated therapist, and her books are full of powerful insights, helping sufferers to better understand their illness and improve the quality of their lives! Everything you need to understand and deal with the issues of OCD from someone who has experience of it. Really insightful read for both me and my family. It made it easier for me to discuss my difficulties with them by referring to certain chapters of the book. Lynn has done a great job. This book has helped my family understand more of what I’m going through and how to support and help me. It’s great to have a book that helps the sufferer and those close to them. I can’t recommend this book enough! Lynn’s understanding of OCD, matched by her professionalism and humanity, turns this book (as with her others) into a bible for all with experience directly or indirectly of OCD. Splendid and informative read! What a difference this book has made to my clients. Lynn Crilly has explained everyones part to play in this outstanding and informative book. This book is the most comprehensive OCD book on the market, insightful, educational, easy to read and understand. The way it’s written shows the compassion that Lynn has for the subject of mental health and I believe this book is really helpful to both sufferers and carers, allowing the reader to deeper understand the behaviours and mindset of sufferers whilst showing that there are things that can be done – there is always hope. Highly recommend it. So helpful, such insight, so caring, a real must for all who come into contact with this disease. Great author she’s so caring to people like myself with problems and conditions, I’m glad to be taking part in her latest edition. Such a wonderful lady and family to work with! I found the book very insightful, touching and most of all reassuringly hopeful – that there is in fact hope for people to live well and overcome conditions like this. The nice thing about Lynn is that she says it as it is “no airy fairy” or technical language. As a straight talking person I like people who do the same! We see lots and lots of self help books but Lynn’s one are ones we enjoy reading infact the OCD one is a great conversation starter with strangers wishing to know about the book recently at a DR’s surgery I gave an interested party my copy of the book! The self help market is littered with so called “experts” many of which I have had dealings with as a sports agent (on behalf of my clients) however Lynn is a nice change from the others. Keep going Lynn you are putting the so called “professionals” with letters after their name to shame! You should sit on the Government task force might give them a sensible voice of reason! Lynn nailed it with this practical guide to real life challenges. Thank you! A refreshing read!! And really does bring out all the positive aspects for the outlook on life! Even better than the first if possible! A brilliant book where Lynn explores all aspects of OCD. The best part of the book is the personal opinions. Lynn has done it again and keep going with all of the hard work! ..a splendid book much needed for those needing help understanding self and indeed others..
As a trainee counsellor I have found this book a vital tool to use in my training and will continue to use it as a great reference book. Lynn explains things in great detail but also keeps in simple and “down-to-earth” with her approach. Another amazing book by the most wonderful author. Lynn has a way of giving hope and light in what feels like the darkest of times and I highly recommend this book to anyone. Another excellent book. As ever Lynn shines writing a book with brilliant insight into mental health. This is such a powerful and inspiring read for anyone affected by OCD. It really does give hope to families struggling to make sense of this much misunderstood illness, while also giving absolutely vital information and real personal insight. A fantastic read and so on point , it was really helpful for me to be able to get a better understanding of OCD . It’s written in such a warm way , easy to read and understand , great practical advise , Thank you . Absolutely love this book, very talented author, mother and dear friend ! Great book, such a help not just for me but my parents too. Lynn, as ever, is doing a great job in helping others and raising awareness in different areas of mental illness. Reading this book is like having Lynn in the room with me: you are learning and the answers are all in a down to earth no nonsense way. The other beauty of this book is that in my opinion it can be used as a ocd dictionary: you don’t have to read it from cover to cover to begin with. You can go straight to the part that you are interested in. When you have done this you will want to read the rest of the book. Gives an excellent understanding to such a misunderstood illness. Lynn explains things using language that is easy to understand. She is both reassuring and informative. I cannot recommend this book enough. Brilliant book based on facts very imformative and easy to read. Written in laymen terms so as even the inexperienced can understand and grasp the methods needed to be used to make life easier. Such a great read. Such a great author with personal understanding. Fantastic book, full of great information that everyone can understand. This book has really changed my perceptions of OCD, my sister struggles with this illness and to be honest before I read this easy to understand book i was super naive. I am so grateful I came across this, it has helped me to support my sister so much more as I now understand the angst and suffering she is going through. Thank you. Amazing book. Packed with very helpful info. Amazing book and author really good help!! Such a valuable resource full of helpful and insightful information. And best of all it’s written in such a warm and understanding way which makes it a source of comfort too. This book is a must for those struggling with OCD but also perfect for an insight into understanding what people with OCD go through. This book is a fantastic resource for teachers and parents alike. I have learnt so much about OCD and ways in which I can support my students. It is written with kindness and understanding and for people who don’t get science. Written with the people OCD affects at the very heart of it. I cannot recommend it enough. A brilliant read for those who have OCD and their carers. If you need help in understand OCD, this is the book for you. Great book, helped me understand what my step daughter was/is going through. Now helping her and us a great deal. What a find. An excellent book on an often difficult subject written in an easy to absorb format. It’s a life changing book. Can’t recommend it highly enough. Such an amazing book. Not only had I read it, but I’ve lent it to a few friends and they have found it most helpful. Lynn’s been so open and honest by drawing on her own experience with Sam. So brave to bare it all. Truly admirable.